Monday to Friday, I commute from New Lynn Train Station into the CBD. I know first-hand the problems our city’s public transport system suffers from. Thankfully, there has been progress in recent times. The completion of the Western line’s double-tracking is almost in sight. This has resulted in a noticeable improvement in services for those who commute from Waitakere. However, there are still significant upgrades that need to occur before Auckland has a 21st century public transport system. The most important project that needs to be implemented is the CBD Rail Loop. What would the CBD Rail Loop encompass? After several studies, the Auckland Regional Transport Authority released its preferred route for the CBD Rail Loop in March this year. The loop as proposed would be an under rail tunnel running between Mt Eden and Britomart Train Stations. It would run parallel up Queen Street and encompass Khyber Pass Road, Symonds Street, and Karangahape Road. Three locations have been suggested as possible train stations on the loop; Symonds Street/Khyber Pass Road, Karangahape Road/Pitt Street, and Albert Street between Victoria and Wellesley Streets. Why do we need a CBD Rail Loop? The loop will be of considerable benefit to not only Central Auckland but Greater Auckland as well. The rail network’s capacity to carry passengers will be given a much needed boost. At present the network can sustain 24 million passenger trips a year. If the trend of booming passenger numbers continues, this capacity level will be reached within the next ten years. The loop is needed to increase this current capacity level, and to increase the frequency and reliability of services. The loop is also an important first step to expanding the rail network into other areas not currently served in Auckland. For West Aucklanders, it would be the initial step for a train service direct from West to South Auckland. It will also be the foundation for a train line to the airport and to the North Shore. Even if you don’t use the train you will see a benefit. 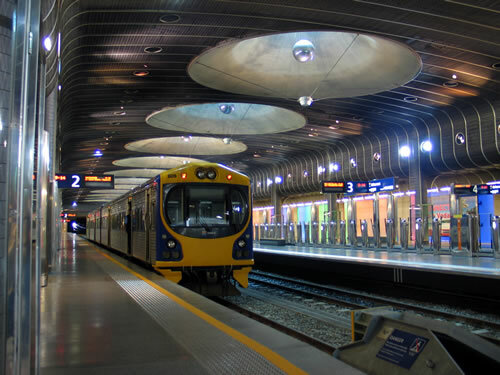 More train services will mean more transport choices for Aucklanders. More people will use the train instead of driving their cars, freeing up the roads for cyclists and motor vehicle users. The loop is also necessary for the future infrastructural needs of Auckland. Our population is predicted to swell to 2.5 million people by 2050. If our city is to cope, a comprehensive and fully-functioning transport system is vital. The Green Party are the main proponents of the rail loop in Parliament. On Monday the 26th of July, Green MPs Gareth Hughes and Keith Locke kicked off their “Fast-Track the CBD Rail Loop” campaign. The aim of the campaign is to pressure the Government into funding the loop. Almost all of the main contenders in the Auckland Council race are behind the CBD rail loop. That includes the Future West and Future Whau candidates. Other progressive candidates who are in favour of the loop are the Mayoral-race frontrunner and current Manukau Mayor Len Brown, and Chairman of the Auckland Regional Council and CityVision council candidate Mike Lee. What has central government done to support its implementation? Unfortunately, the National-led Government is more interested in “Party Central” than “coming to the party” with funding for the rail loop. Central government funding is necessary for the loop to get on track. But the Government is refusing to support any more major public transport projects, despite committing billions of dollars to roads. One striking comparison is the Government’s commitment to complete the Puhoi-Warkworth motorway. Both the motorway and the loop will cost around $2 billion. The loop, however, will be of far greater value long-term. With electrification of the rail network, the loop will help decrease dependence on petrol, and ease traffic congestion. A new motorway will do the exact opposite. Public pressure on the Government is needed to show Aucklanders desire the rail loop and that it is an important project for Auckland’s infrastructure needs. What can I do to support the implementation of the CBD Rail Loop? The first thing CBD Rail Loop enthusiasts can do is support the Greens “Fast-Track the CBD Rail Loop” campaign. The next important step is to support progressive local government candidates who are in favour of better public transport and getting the loop up and running. We need a council and local boards that are willing to solve the public transport problems Auckland commuters face. Voting for Future West and Future Whau candidates is one way of ensuring pressure is put on the Government to “get in the loop” and fund this much needed public transport project. Good post Ciaron. With the prospect of us reaching peak oil in the next decade or so the choice between a transport improvement that will reduce dependancy on oil and one that will makemit worse ought to be a no brainer. We need politicians who will take a long term view.